Pretoria – Jaguar Land Rover’s self-driving cars can find spaces by themselves and park without any driver input. The automaker's "self-driving valet" demonstration in the UK is a step towards making self-driving cars an everyday reality, with technology that removes stress from urban driving. 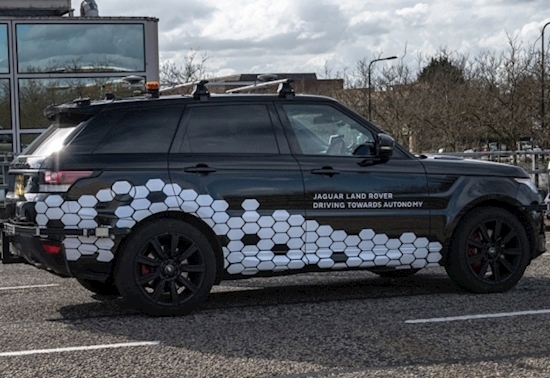 It took place on open public roads in Milton Keynes as part of Jaguar Land Rover’s work with UK Autodrive, a consortium testing self-driving vehicles and connected car technologies. Joerg Schlinkheider, Jaguar Land Rover Chief Engineer, Automated Driving, said: "We're investing heavily in automated technologies to make our customers' lives safer and more convenient. Reducing the everyday stresses of driving – like squeezing into a tight parking place – means that we can all focus on the more enjoyable aspects of our cars." Jaguar Land Rover has also developed connected technology to help speed up the integration of automated driving features. The tech allows cars to ‘talk’ to each other and the surrounding environment, giving drivers the right information when they need it and helping the car react more quickly. The company has tested two features in Milton Keynes: Emergency Vehicle Warning and Electronic Emergency Brake Light. Jaguar Land Rover is developing fully- and semi-automated vehicle technologies to offer customers a choice of an engaged or automated drive.